Multiple Grade 1 winner Rock Fall, one of the favorites for the upcoming Breeders' Cup Sprint, suffered a fatal injury after breezing on Keeneland's main track on Saturday morning. According to multiple reports, Rock Fall broke down in both front legs and fell while galloping out from a work in company. Initial reports were that the exercise rider was unhurt. One of the stars in the sprint division this year, Rock Fall captured the G1 Alfred G. Vanderbilt, the G1 Vosburgh, and the G2 True North. 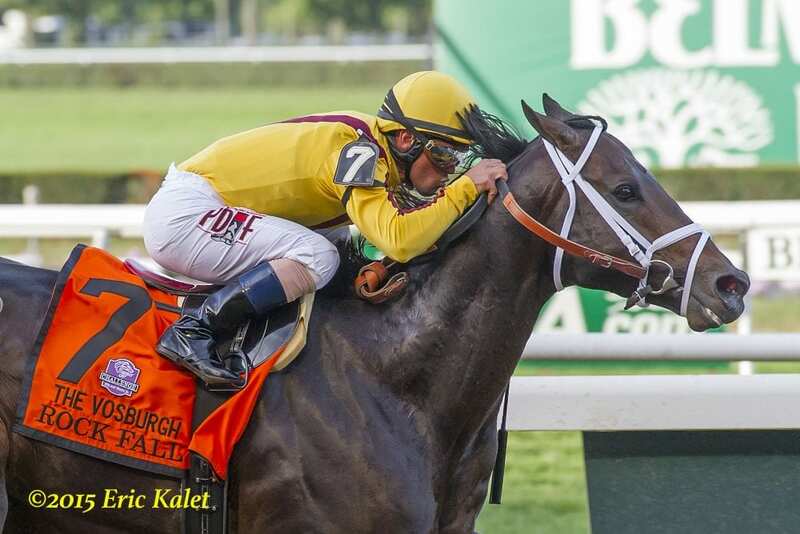 Owned by Barbara Banke's Stonestreet Stables and trained by Todd Pletcher, the 4-year-old son of champion sprinter Speightstown was seven-for-eight with earnings of $749,180. Bred in Kentucky by SF Bloodstock, Rock Fall was the first foal from the Medaglia d'Oro mare Renda, a multiple stakes winner. He was consigned to the 2012 Fasig-Tipton Saratoga Yearling Sale by Peter O'Callaghan's Woods Edge Farm, agent, and purchased by Stonestreet for $250,000. It was recently announced that Rock Fall was set to stand alongside his sire at WinStar Farm, beginning in 2016. This is a developing story. More information will be added as available. This entry was posted in Breeders' Cup and tagged breeders' cup sprint, Horse Racing, Keeneland, Paulick Report, Rock Fall, Speightstown, Stonestreet Stable, thoroughbred, todd pletcher by Paulick Report Staff. Bookmark the permalink.